BIOSTAR’s latest Intel based motherboard features a DDR4 + DDR3 combo solution, Super Durable Solid Capacitors, and the BIOSTAR 6+ Experience. With BIOSTAR’s enhancements users will enjoy mainboards that have enhancements in these areas of BIOSTAR expertise: Audio+, Video+, Speed+, Protection+, Durability+ and DIY+. BIOSTAR’s latest mainboard, the Hi-Fi Z170Z5 is based on Intel’s H170 chipset which is a single-chip design that supports Intel 6th generation socket 1151 Intel Core processors. 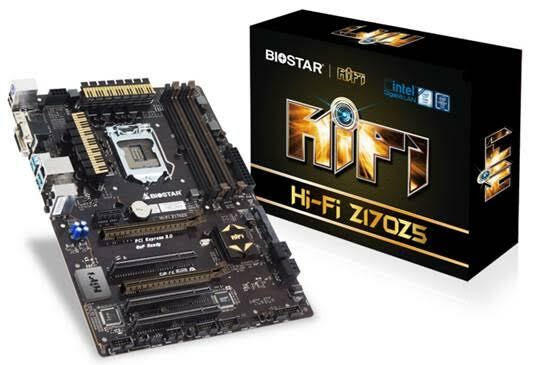 The Biostar Hi-Fi H170Z5 features support of either DDR3 or DDR4 memory modules with 2-DIMM DDR3L-1866(OC)/1600/1333 for up to a 16G maximum capacity and 2-DIMM DDR4-2133/1866 for up to a 32G maximum capacity. For music lover, the Hi-Fi Z170Z5 comes with Hi-Fi Technology built inside, delivering Blu-Ray audio, Puro Hi-Fi features an integrated independent audio power design with a built-in amplifier. The technology utilizes audio components with an independent power delivery design for a significant reduction in electronic noise producing superb sound quality. Audio power is an important factor in audio quality. Most AV equipment isolates the power supply for each analog and digital signal to gather high-quality sound reproduction. Equipped with BIOSTAR Hi-Fi Power technology, the Hi-Fi Z170Z5 utilizes audio components with independent power designs for a significant reduction in electronic noise and superb sound quality. For online game lovers, The Hi-Fi Z170Z5 supports DirectX 12 which introduces the next version of Direct3D, the graphics API at the heart of DirectX. Direct3D is one of the most critical pieces of a game or game engine, and we've redesigned it to be faster and more efficient than ever before. Direct3D 12 enables richer scenes, more objects, and full utilization of modern GPU hardware. There are several design features that work towards providing a more durable motherboard on which to build a system. Low RdsOn P-Pak MOS is a low resistance design that can significantly reduce the current in energy loss. The Hi-Fi Z170Z5 also comes with the best quality solid state capacitors with ultra low ESR design, these Super Durable Solid Caps doubles the lifespan of the capacitors. Not only that, this board features a “Moistureproof” PCB design. That means that even in rural or coastal areas with high humidity the board will be resistant to moisture.